Midsummer weekend, 2011. 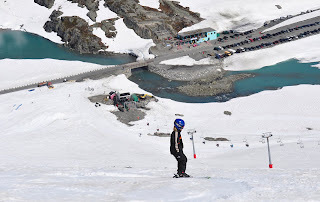 The good news is that I have a day of skiing in one of the best summer ski places on the northern hemisphere, Stryn, Norway. The bad news is that the glaciers really are melting. And that's affecting my day at Stryn, as the upper ski lift is being rebuilt to accommodate for the changed shape of their glacier. 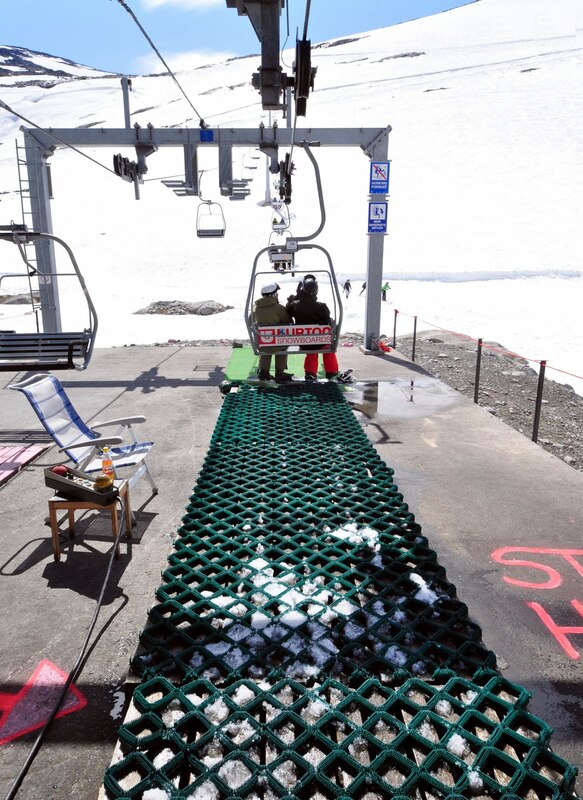 This means that half of the ski area is out of action, at least unless one spends an hour or two walking up. And I can not do that today, skiing with a kid. But at least its a great, warm and sunny day. The summer ski areas always advertise themselves with pictures of people skiing in their swimsuits. That's as far from reality as it can be, normally. 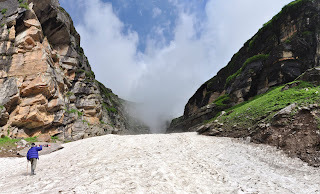 There's a reason why these places have snow: they are either very cold (high up) or they have always bad weather (it rains a lot). But we are lucky today, swimsuits would almost be enough. On a normal day it would be at least cloudy and cold, if not foggy and rainy. I like Stryn because of its relaxed attitude, off-piste opportunities, direct access to the slope from the first ski lift (no one hour commutes to the top of mountain, like in the Alps) and the availability of many other interesting sights nearby. But mostly I like Stryn because unlike many other summer ski places, Stryn has steep ski runs. 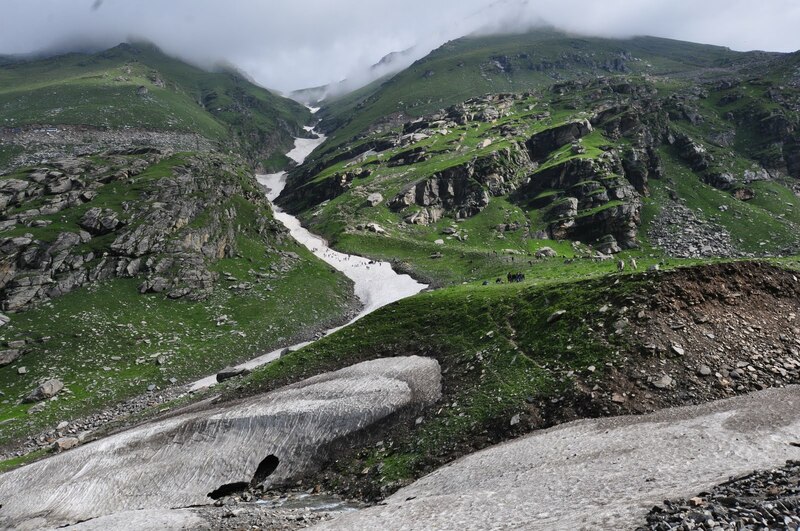 Its wonderful to descend a steep slush face with views of green lakes and waterfalls underneath. Stryn receives an enormous amount of snow every year, as the winds push moist air from the fjors towards the mountains. The amount of snow varies between 5 and 15 meters annually, and in the summer when the snow depth is only 5 meters they open the ski area! Its typically open from May to July. The snow in Stryn feels natural, spring snow. 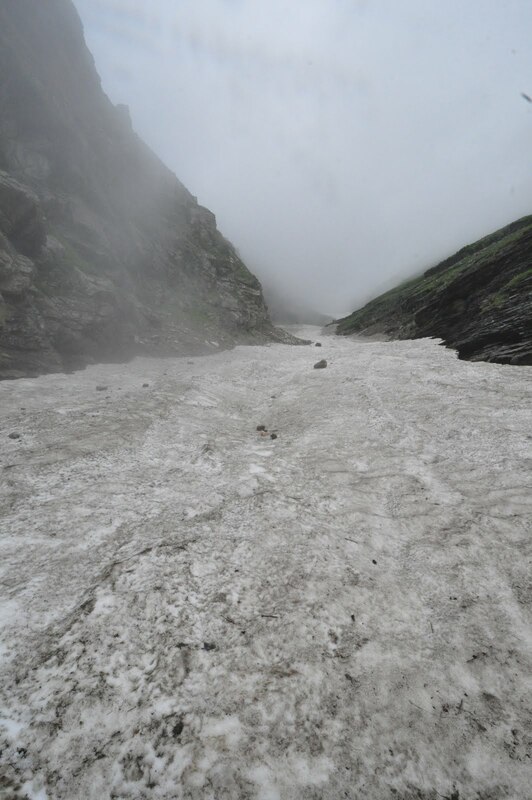 Not rock hard high-altitude glacier snow. 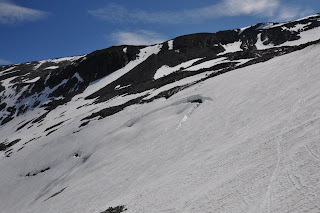 There's really only one ski slope at Stryn: straight down, a bit to the skier's left from the lift. Be careful about the cat track that switches back and forth, as there can be big drops next to the track. But most people take themselves little further to the skier's left, few hundred meters from the ski lift. For a summer ski run, this is a steep, sustained slope. But the real benefit are the views: you are skiing straight towards a waterfall and the lake. On a warm day late in the season you make a turn here, make the next turn, and flying snow from the previous turn hits you on the back. Nice! The other off-piste option is to take yourself to the top of the upper ski lift and then go far to the skier's right, staying on top of the ridge. Ski down a steep snowy gully that goes down on the side of the ski area but keeps turning a bit to the right (see the middle of the picture on the left). Once you are down from the steep section, go straight towards to the ski area, but be careful about the crevasses that exist on this area. Do not take this ski run unless you know what you are doing! There are further off-piste ski options by going far to the skier's left, down towards the road that comes from the valley, hitching a ride back to the ski area. But I have not tried those routes. Here are the essential parameters for Stryn: The base of the ski area sits at 1080 meters, and if all lifts are operational, the top sits at 1600 meters. This means over half a kilometer of vertical. 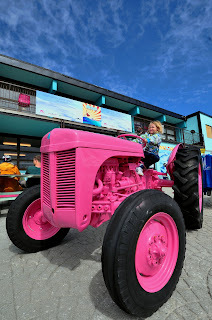 Lift tickets cost 330 crowns or about 42 Euros per day for adults. It takes roughly half an hour to reach the area from the valley bottom, and an hour from the town of Stryn. 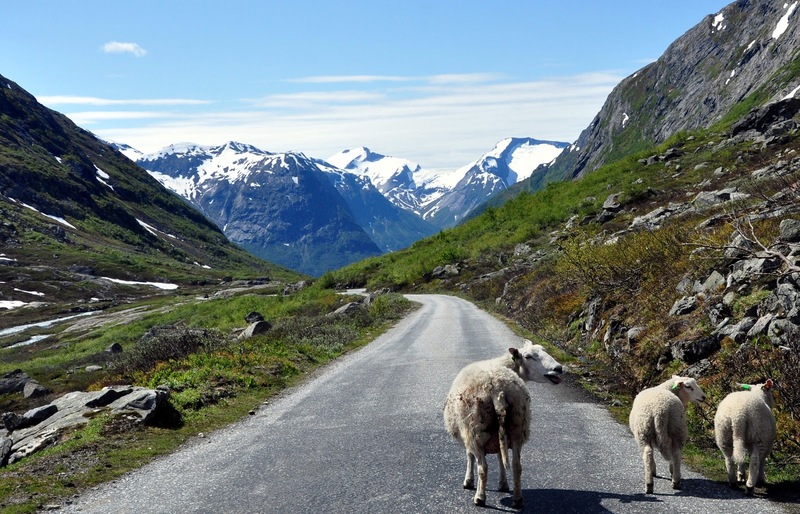 The road to Stryn has countless switchbacks, and can be tiresome to drive for the inexperienced. The first time I was here twenty years ago the engine of our car shut down on every attempt to shift gears. Not a good vehicle for these roads. You should also watch for sheep on the road. And nearer the ski area, watch for boarders flying over the road. 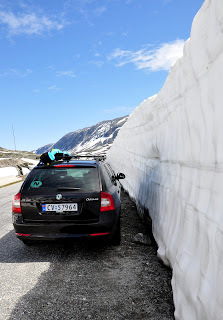 This year the snow banks next to the road were small, but on our previous visit they were 5-10 meters high. Its a popular but dangerous sport to try to jump over the road at high speed. We found the Strynsvatn Camping an excellent base to stay at, half way between the town and the ski area. A fully equipped, new cabin for eight costs about 160 Euros per night, smaller cabins or tent and camper van slots are cheaper. The views are spectacular. There are more services in the town of Stryn, but it is not as exciting place to stay at. And its a central place for touring Geiranger, Briksdalsbreen, Galdhöpiggen, Jostedalsbreen National Park Center, or any other nearby attractions. And these sights are definitely recommended -- Norway is full of wonderful places to visit. 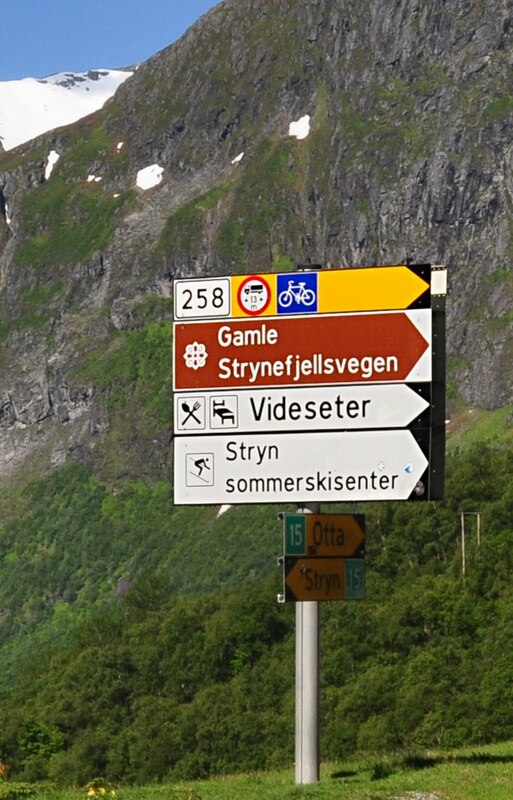 Stryn is roughly half-way between two major cities, Bergen and Trondheim, 300 kilometers from each. The only practical way to reach it is by car. 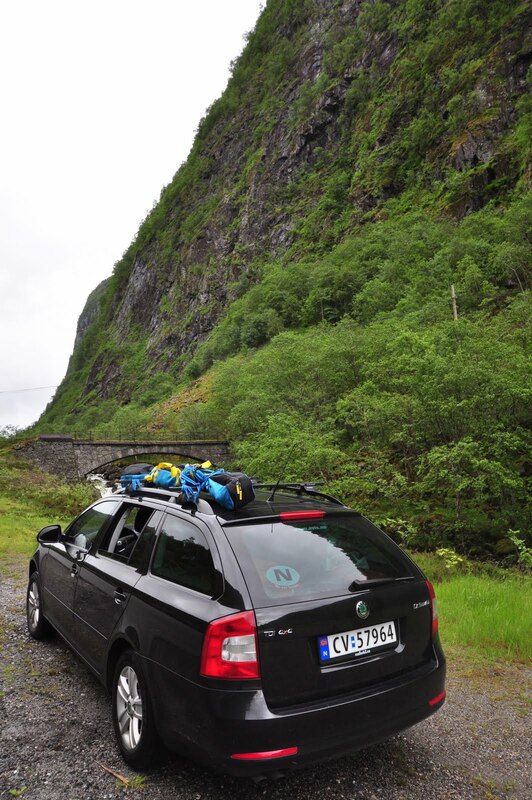 Driving is easy from Scandinavia, elsewhere you'll have to fly in first. We flew to Bergen and flew back home from Trondheim, using the local low-cost carrier, Norwegian Air Shuttle, which turned out to be not so low-cost after we paid for the luggage and ski bag transport. A couple of days ago I was arranging my trip to Quebec, Canada that is coming up in two weeks. 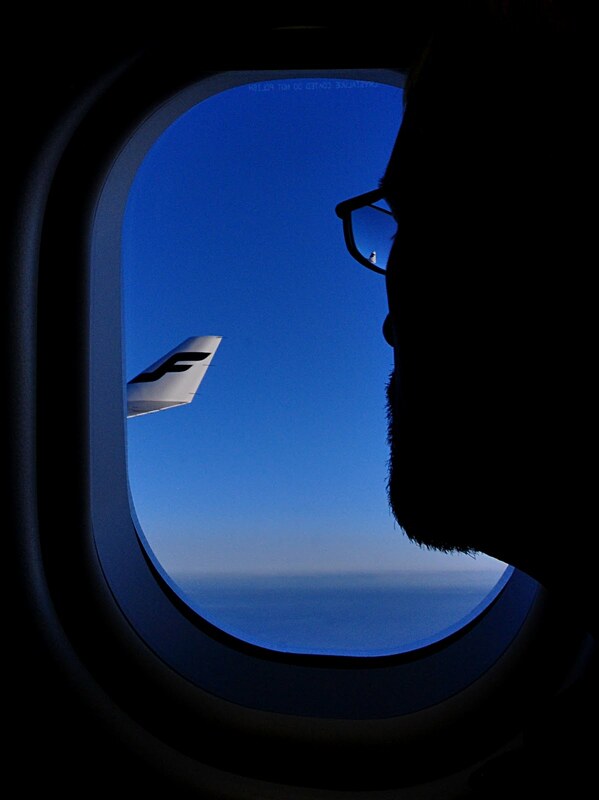 I had two options, either use a Finnair flight or an Icelandair flight. The advantage of the Finnair flights was that I would get to use my normal airline, collect points and spend a little bit less time on the trip. The good thing with the Icelandair flight would have been that I would have been able to stay a day or two in Iceland, the tickets were a little bit cheaper and travel schedule more relaxed. My plan was to go check out the summer skiing possibilities on Myrdalsjókull, a glacier that sits on top of the Katla volcano. If you remember Eyjafjallajökull from last year, Katla is next to it but much bigger. I ended up booking the Finnair flights, mostly because I had to no time for additional skiing. 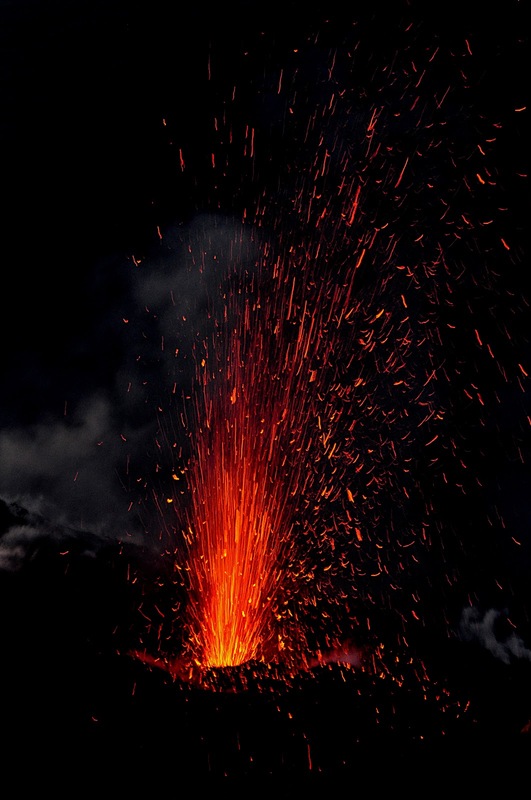 In yesterday's news they were reporting major flooding in the area, and it is suspected that Katla is erupting. The flood washed away a bridge and cut a major traffic route. According to Wikipedia, "Helicopter pilots flying over the glacier also reported cracks in the glacier, suggesting a large meltdown of the glacier on the south-eastern rim of the Katla crater". I'm having a Zen moment. I did find snow and was able to ski, and now the soft clouds, green environment, winding road, sitting Buddha, smoke aromas and the local music was having an soothing effect on me. But this did not come easily. My plan was to go to Rohtang Pass, Himachal Pradesh, India. Never before have I encountered so many obstacles. It started back home, when it turned out to be impossible to find out if skiing was possible. Several sources indicated it might be, but there was no information about the details, no pictures, no phone numbers to call, nothing. Would there be a ski-lift? No idea. Was climbing involved, and what equipment would be needed? No idea. I did know, however, that the heliski operation had ceased for the summer and that while high-altitude touring was possible, it would have required at least a seven day trip. Given the lack of information, there was nothing else to do than to show up and see what happens. And "showing up" was by no means easy. The location is 600 kilometers from Delhi, Google gave me a ten hour drive estimate. I was unable to find any reasonable flights to the area. To be exact, I was unable to find an airport in the area. Luckily the concierge at my hotel was able to organize a ride, a driver and a car. 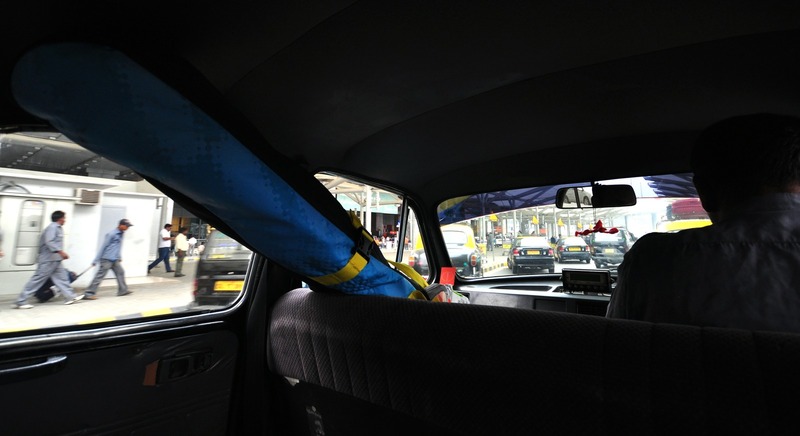 A taxi. When I met the driver, however, he said that our ride would take 14 hours from Delhi to Manali. That is before going up the actual mountain. And I had no idea what kind of driving was required even to make that 14 hours. On the first hour of the drive I woke up to a violent crash. Someone had driven to the backside of our car at high speed. Their car was wrecked, half a meter shorter than before. Luckily no major damage to persons, however. A kid in the other car hurt her face a bit and my neck was stiff. Our car was deformed but functional, so we picked up the loose pieces (like our spare tire) and carried on. This is the kind of an accident that in the US would have sent everyone to the care of their hospitals or lawyers. Here, it seemed like a part of life. I saw many other accidents on the road during the rest of our journey. And I'm not normally afraid of anything, but on this trip I was truly scared about the traffic. 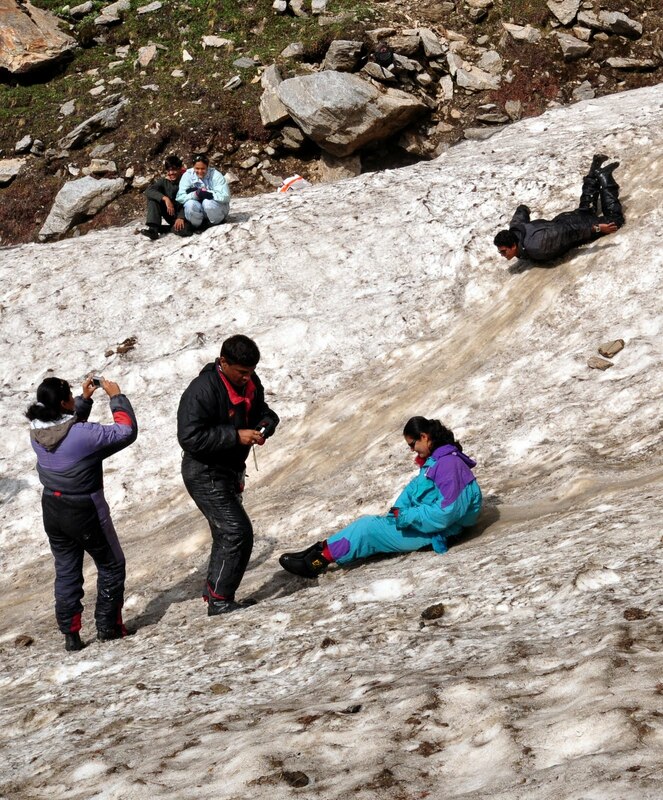 Our accident was nothing compared to the dangers on the mountainous part of our trip. Narrow, winding roads, speeds close to hundred kilometers an hour amidst slow trucks, and terrifying passes both by us and the oncoming cars. And practically no visibility in the turns. But not to worry, as long as we honk the horn before the turn the oncoming traffic will know we are there... maybe. But we did get there. And then had trouble finding suitable accommodation. The first place that we stopped at had the hotel guy proudly demonstrate their rooms for me. Something moved in the bathroom floor. I wanted out. I should have ditched the guys advice at that point, but he wanted us to go to a better place of the same owner. This hotel was by itself reasonable. But their ability to help me get to where I was going was lacking. It took an hour to discuss what we needed for the next day to get to the mountain. No one seemed to understand English. The type of cars and drivers I needed kept changing. In the morning they put me on this tiny Fiat with a guy who did not really know where he was going. As we kept going up the road, it started to dawn on me that the Fiat may not be the right vehicle for "highest Jeepable road in the world" that stops few meters short of four kilometers. 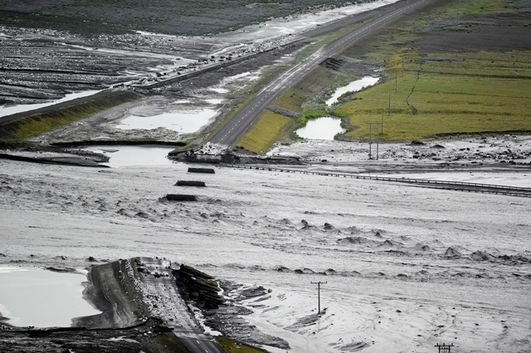 The mud pits got deeper and deeper, and it was simply not possible to continue any more. We reached a bit over 3300 meters and now had to turn back. No skiing? And even the 4wd drivers were telling us that the road is closed due to rock slides. There was nothing to do but to go back. We had one last hope, however, as we had learned from my driver's English-speaking brother that there was another access to the snow. We parked our car at an altitude of 3100 meters and promptly found a solution: a Sherpa and a horse. No problem. 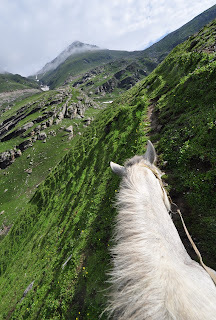 I had never ridden a horse before, so practicing riding on steep, rocky paths between three and four kilometers while carrying ski gear and taking photographs sounded like a fun thing to do. And it was. I have to give it to the horse, however. I was merely a passenger, the horse on the other hand has probably done the trip every day in its life. It set its foot securely, if at times doing it almost at a running speed. I survived. But I did regret leaving my helmet in the car. I was expecting easy skiing, but the helmet would have helped my anxiety about the horse or me falling down. 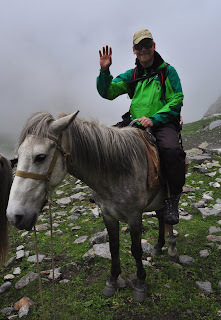 The horse carried me three hundred meters higher, in the middle of a couloir that has retained some snow deep in the shades between the mountains. 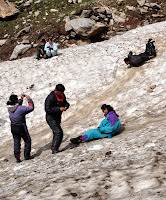 Fifty other tourists, all from India were experiencing the snow, but I saw no one else trying on skis. I decided that I needed to ski from further up, so we started to climb up the couloir. I had just arrived today at these altitudes, so I was taking it easy to avoid getting too exhausted. We climbed up 100 meters and reached 3500 meters. I'm regretting stopping at that point, however. I later learned that the gully continued all the way to the Rohtang Pass at 3970 meters, the highest point in the road. It would not have been fully skiable, there were some rocky sections. But it would have been a nice climb for maybe two more hours, and an interesting ski route. As it were, I skied down from 3500 meters. Maybe it was the right decision, however. 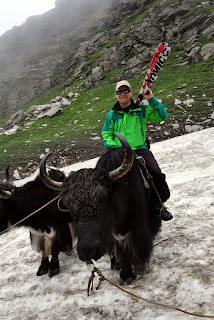 I had a Sherpa with me, but he spoke no English. 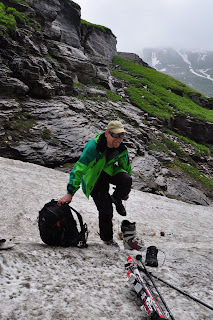 And I was unable to find out if avalanches and rock falls were a danger here. 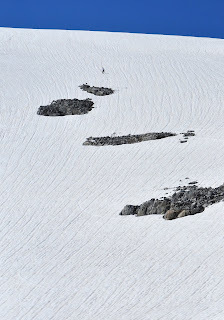 All the snow in the gully was covered with small rocks. 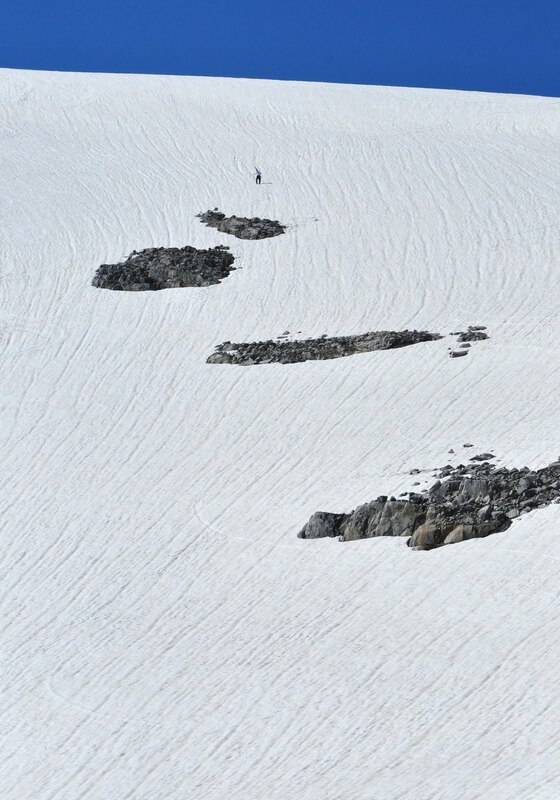 A few meters from where we stopped there was a bigger rock that looked like it had dropped there, not melted from under the snow or brought by the winter avalanches. If you ever visit this place, bring a helmet, crampons, and figure out what the safety situation is. The gully has potential to be a great place to ski, particularly in May/June if the snow covers the entire way. It can also be skied by riding a car up and then skiing down, riding a horse back to the road. Recommended for adventurous skiers. Skiing down was fun, as we skied first in a cloud and then re-appeared back to sunshine. There were plenty of rocks to avoid and some sand and dirt on top of the snow. I'm guessing my ski repair shop is getting yet more work. Sliding was not perfect given the quality of the snow, so some additional steepness would have been nice. When I walked back to the tourist area there were opportunities for riding some bigger animals, sliding down with a tire, food, trying on some local clothing, and other fun stuff. The local people are friendly and happy folk. I wish understood their language. Practical details about the trip? I got 125 meters of vertical in my 1 minute 53 second ski run. I spent 1274 times more time to get here and back (40 hours), which is an even worse ratio than on my infamous trip through Poland. But of course the value of the trip was not just the skiing. The scenery, the people, hiking up, riding horses, food, and everything else was mind-blowing. 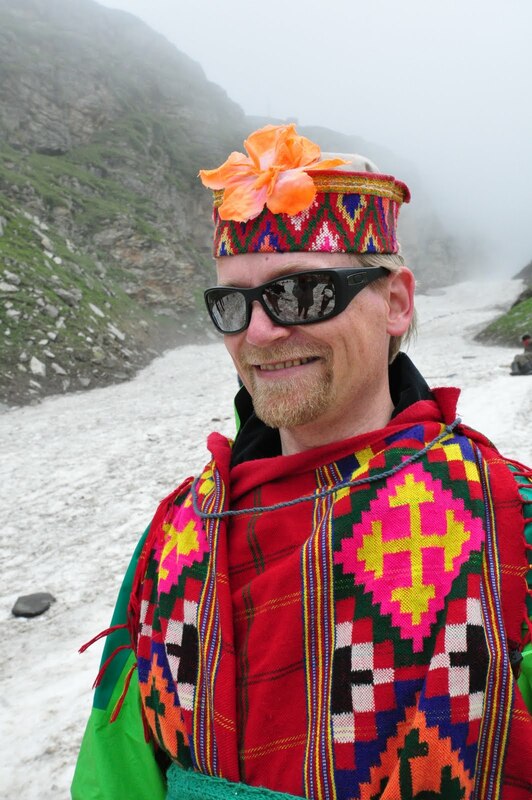 I forgot to ask about the price of Goulash soup, but if soup costs a bit over a Euro in a fine-dining restaurant in Delhi, it cannot be very expensive in the Himalayas either. 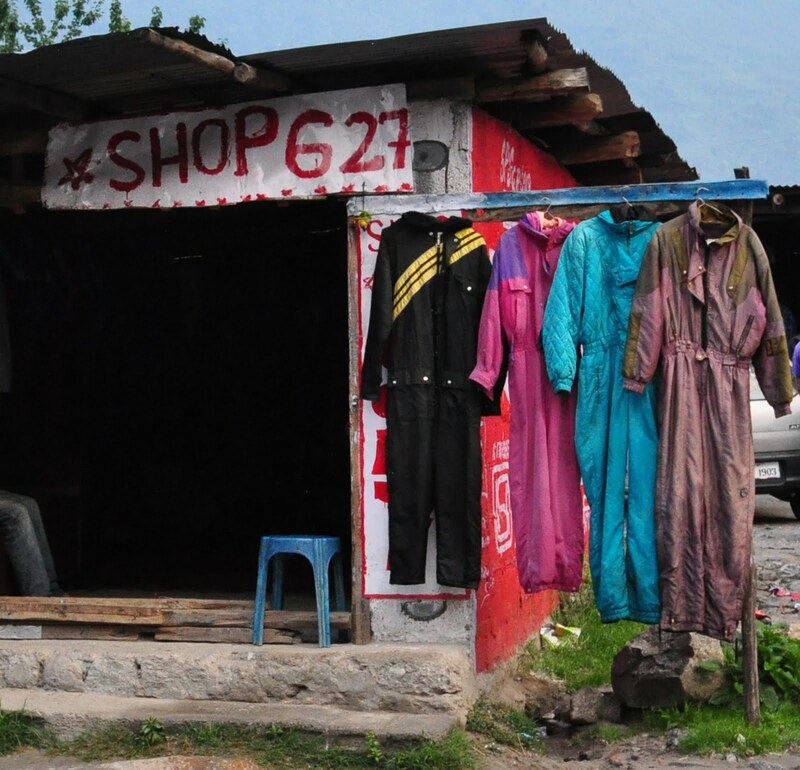 I paid 26 Euros for night for the accommodation at Manali, the main village next to the Rohtang Pass road. And the highest price that I ever paid for a taxi ride: over 300 Euros. But I have to hand it to my driver. He did get me back alive. And he drove for 28 hours within the space of only 40 hours (he slept while I was on the mountain). Given a choice, I would have visited this area in the winter time. There are a few small ski areas, but a lot more options for venturing to the mountains in the winter. There is a heliski operation between January and March, for instance. They can take you all the way to 6500 meters, perhaps something to try some day in the future. On the trip I also found out that it might have been possible to fly to this area after all. 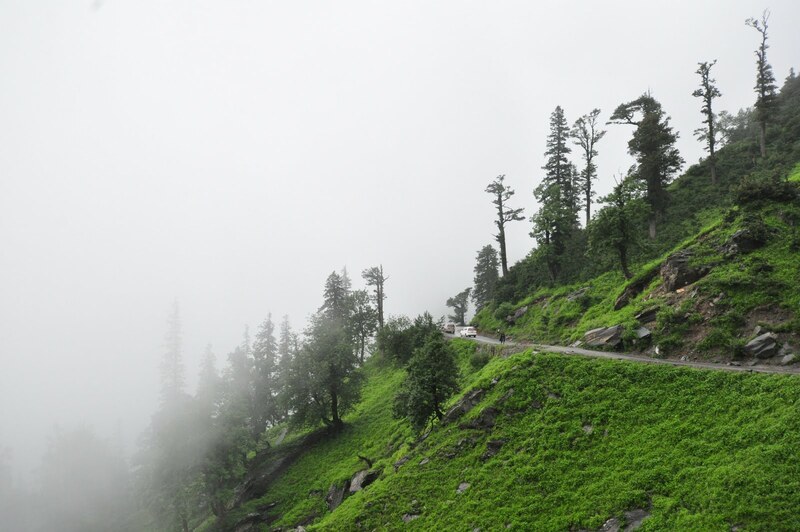 There's an airport near Kullu. That might have been a better option, if there are flights to Delhi. 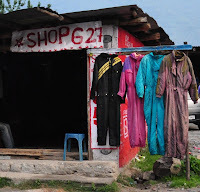 There are plenty of shops in Manali for ski gear and clothing, but I would recommend bringing your own if you have special requirements. The businesses are tailored towards local people who are here to see snow for the first time, not for experienced western skiers or climbers. Conclusions? I learned a lot from the Indian way of life on this trip. Practical details sort themselves out, eventually. Learn to love everything that the country offers. Relax. 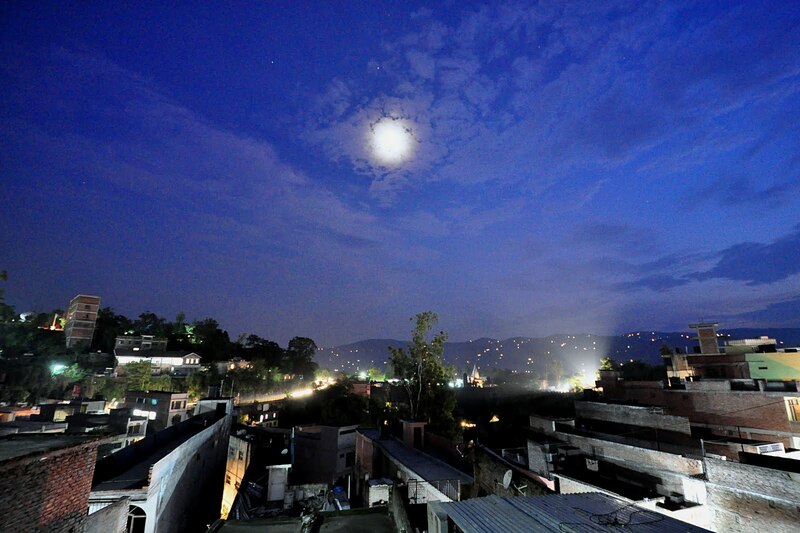 Listen to some local music, smell some aromas, let the Buddha guide you. And while in India, drive in a big car. Sit in the middle of the vehicle. Eat only heated food, and only from places that are popular with the locals as well. Figure out the way to use the hole-in-the-floor toilets. Some good advice for traveling here can be found from the book by Madventures (my spiritual leaders in matters of travel). Landed in Delhi for some customer meetings. But first things first, Himalaya is kind of close. Sharing a taxi with my skis for the next 600 kilometers. Lets see if I'll find snow.